Brahma Kumaris of WA, the WA section of the National Council of Jewish Women of Australia and UNAA of WA will celebrate UN World Peace Day. UN International Peace Day will be celebrated at Peace Grove Memorial at Arden St, East Perth Park (back of Gloucester Park) on Friday, September 21. The Celebration will begin at 10:00am. There will be an Opening address at 10:30AM by Judith A. Parker AM, DSJ, President of the United Nations Association of Western Australia. 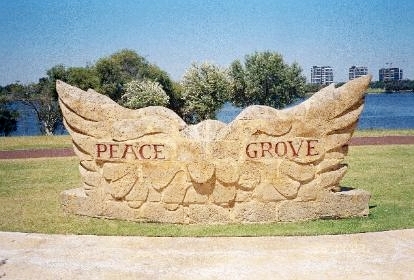 Peace Grove is located along the Swan River foreshore, Arden Street, East Perth 6004. The memorial consists of a “Dove Seat” and a “Peace Plinth”, both of solid stone. The Dove Seat is a seat structure, the back being the design of a dove with its wings spread. The Peace Plinth is a solid square base which displays the plaque. Australia. Egypt. Israel. 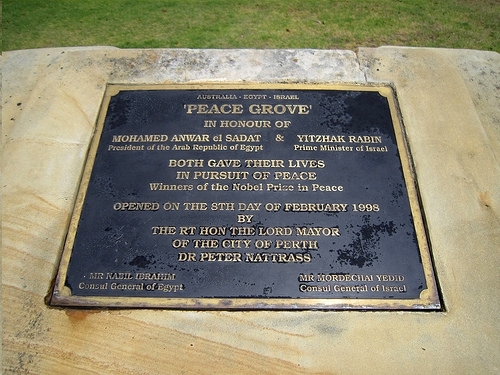 “Peace Grove”. In honour of Mohamed Anwar el Sadat, President of the Arab Republic of Egypt and Yitzhak Rabin, Prime Minister of Israel. Both gave their lives in pursuit of peace. Winners of the Nobel Prize in Peace. Opened on the 8th day of February 1998 by the Rt Hon The Lord Mayor of the City of Perth Dr Peter Nattrass. Mr Nabil Ibrahim, Consul General of Egypt and Mr Mordechai Yedid, Consul General of Israel.